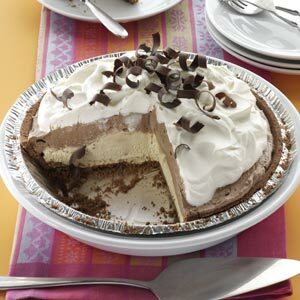 I love coffee and this creamy pie is tops in my recipe book. Dissolve coffee granules in hot water. In a large bowl, beat cream cheese and confectioners' sugar until fluffy. Add vanilla and coffee mixture. Fold in whipped cream. Spoon into crust. In a small bowl, dissolve coffee granules in milk. In a large bowl, combine milk mixture and pudding mix. Beat on high speed until pudding is thick. Fold in whipped cream. Spread carefully over cream cheese layer. For Kahlua Cream topping: In a small bowl, beat cream until it begins to thicken. Add confectioners' sugar and Kahlua; beat until soft peaks form. Spread over pudding layer. Top with chocolate curls if desired. Refrigerate for 2 hours or until set. Yield: 8 servings.